Donna Fitchett sentenced for the murders of her 11 year old and 9 year old sons. A North Balwyn woman convicted of murdering her two sons has been sentenced to 24 years jail. 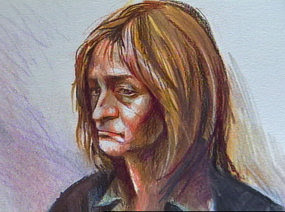 The Supreme Court was told Donna Fitchett, aged 49, drugged and stranged her boys, 11-year-old Thomas and 9-year-old Matthew, in 2005. She pleaded not guilty to two counts of murder. During the trial, her defence argued she suffered from severe depression, and did not realise what she was doing was wrong. The Court heard that after the killings, Fitchett slashed her wrists and took an overdose, leaving a suicide note for her husband. In sentencing, Justice Geoffrey Nettle said the nature and gravity of Fitchett's crimes were appalling. He said, the idea of a mother killing her children was particularly shocking. Fitchett will serve 18 years in a psychiatric hospital before being eligible for release. Quote: A bit of a contradiction in terms her being found guilty of murder and not guilty of mental illness considering she has to serve “18 years in a psychiatric hospital before being eligible for release." Does the law want it both ways?